Amelia is here to help give you the inside track. 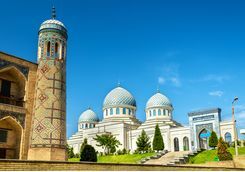 This is one of our gentle cultural tours to Uzbekistan that takes in the best of the Silk Road cities at a leisurely pace. 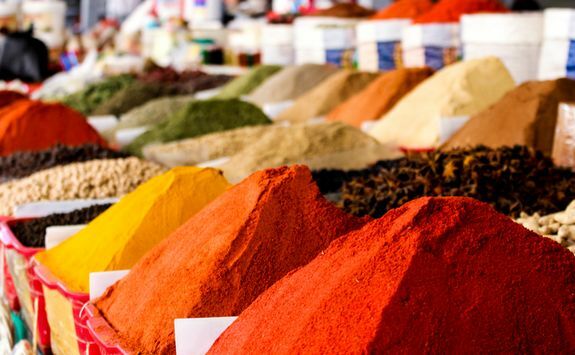 There is plenty of time for soaking up the sites, smells and sounds as well as shopping in the fabulous bazaars. 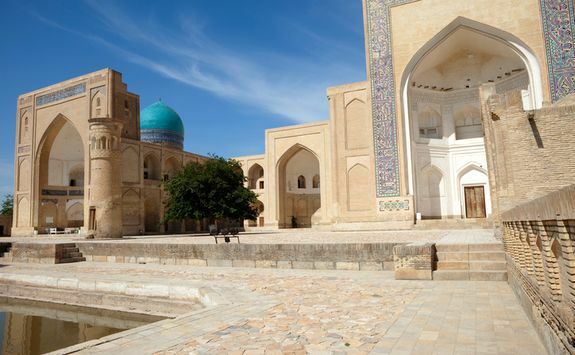 Most importantly you'll visit the many mosques, madrassahs and markets that make the Silk Road so fascinating. Head to Heathrow Airport this evening and meet your fellow group members and intrepid tour guide Amelia. 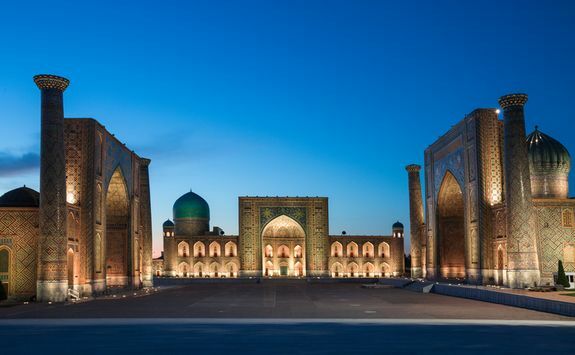 After brief introductions you can then all check in and board your direct, overnight flight to Uzbekistan's Tashkent Airport. The flight time is around seven hours. 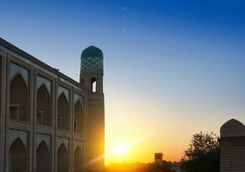 Arriving into Tashkent early this morning you'll be met by one of our ground team and transferred to your hotel in the city centre. You then have the morning to rest before a local guide meets you all for lunch at a nearby restaurant. 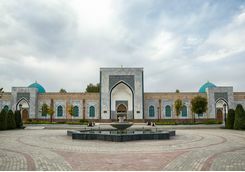 Afterwards you will have a gentle sightseeing tour of Tashkent, including visits to Chorsu handicraft market, Kukaldosh Madrasah and Khast Imam Complex. 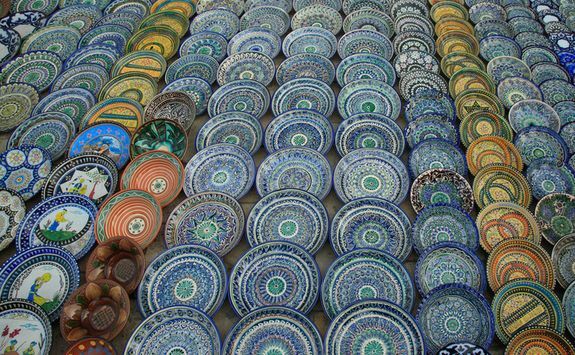 There might also be time to visit the Applied Arts Museum. 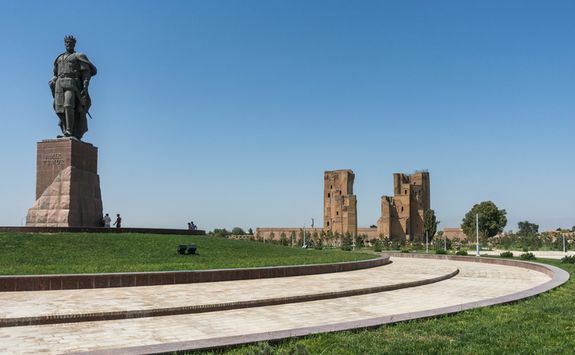 Sadly, much of the city was destroyed by an earthquake in 1966 and the architecture of massive squares and wide avenues obscure much of the city's 2000-year history as a crossroad on trade routes. 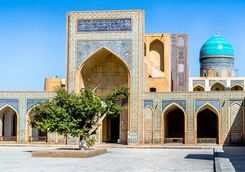 This morning you will check out early and transfer to the train station to catch an early fast train from Tashkent to Samarkand. 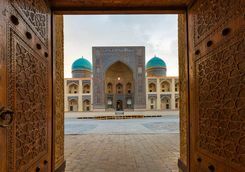 It is a two-and-a-half-hour journey and the train is comfortable with time to relax and read up on the fascinating history of Samarkand while a landscape of cotton fields and little villages speeds by. On arrival you will be met and taken to your hotel. 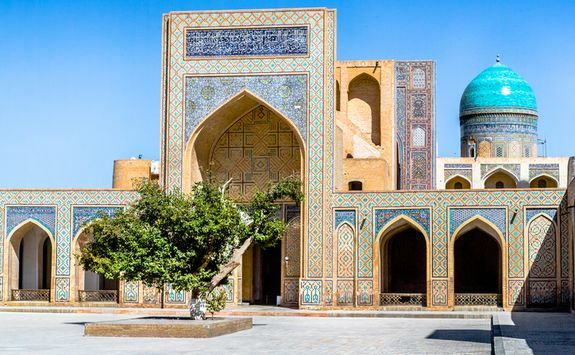 After lunch in a local restaurant, you will all visit some of the sites in the Imam Al Bukhari complex and the local bazaar. 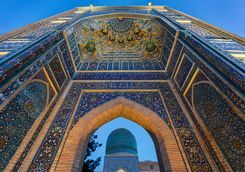 The UNESCO recognised city of Samarkand is notable for being an Islamic centre for scholarly study and is the second largest city in Uzbekistan with a population of about 400,000. 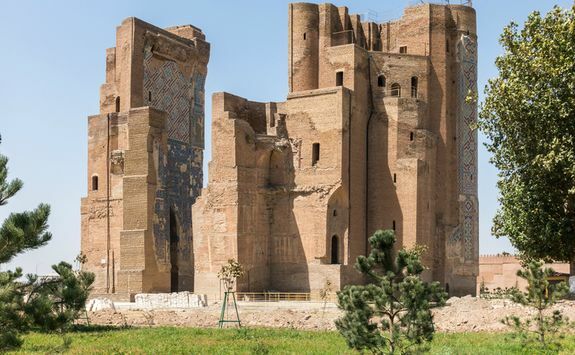 It is also the same age as Rome or Babylon with a crucial strategic position on the Silk Road between China and the West. 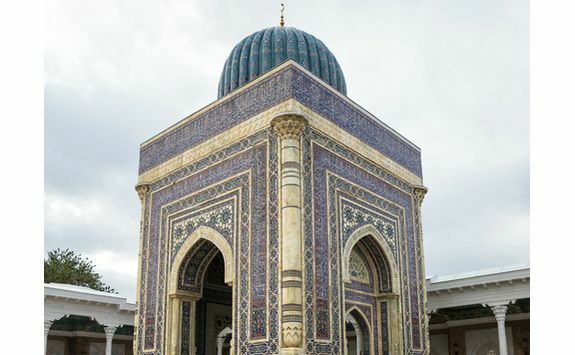 Today enjoy a full-day sightseeing tour of Samarkand with Amelia and a local guide, including a visit to Registan Square, Guri-Amir Complex, and the beautiful Bibi Khanym Mosque. 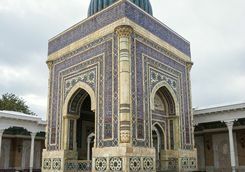 Bibi Khanym is a famous historical Friday mosque in Samarkand whose name comes from the 14th century ruler Amir Timur. 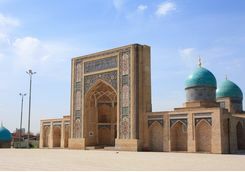 History states that after his Indian campaign Amir Timur sought to construct a gigantic mosque using countless precious stones carried by 90 elephants. 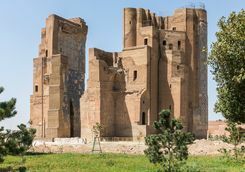 Unfortunately because it was built too quickly the original structure couldn't withstand the region's earthquakes, so in the mid-1970's a new building was constructed as an exact replica,. 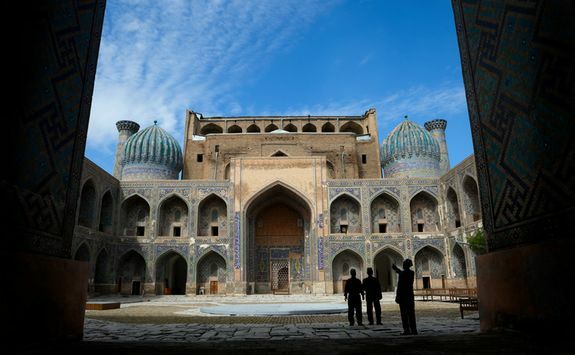 The good news is that the bazaar beneath is still as it was 600 years ago. 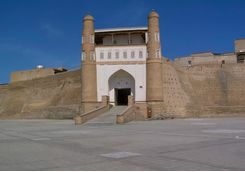 You will also visit the Shakhi Zinda Necropolis, Ulugbek Observatory and the Afrosiyob Museum. 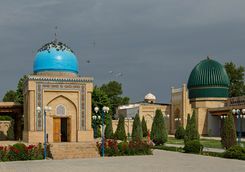 In the evening there will be a visit to a local vineyard for some Uzbek wine tasting and dinner. 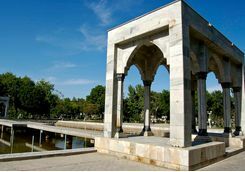 Today you have a day tour to Shakhrisabz - the homeland of Tamerlane and located about two and a half hours drive away from Samarkand. 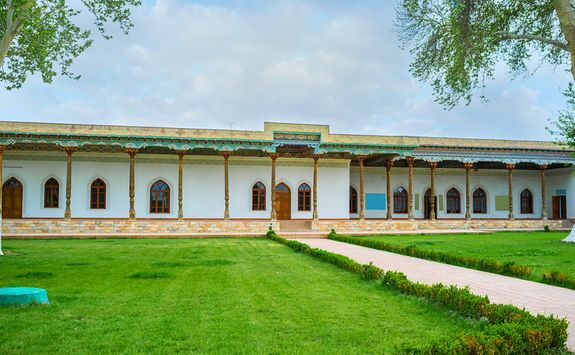 On the way to Shakhrisabz, there might also be time to stop at a local farmer's house. 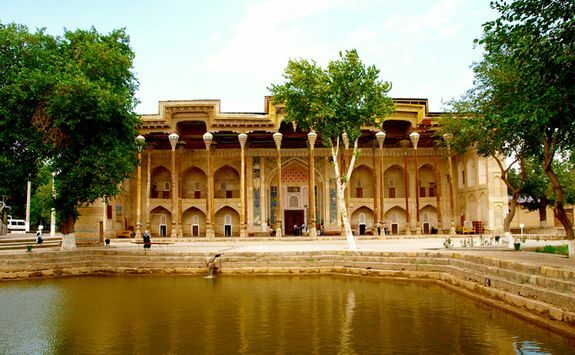 On arrival, there are visits to Ak Serai Palace, Kok Gumbaz and Dorus Saodat Complexes. 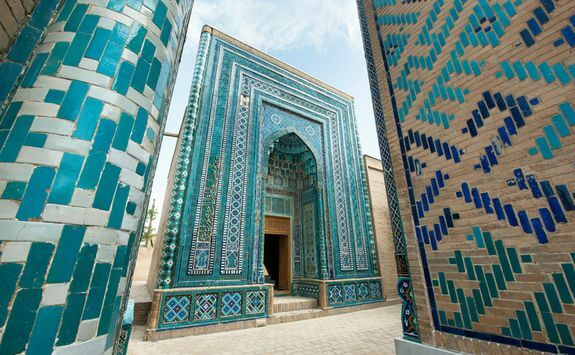 These structures are decorated beautifully in blues, greens and golds across the mosaics. 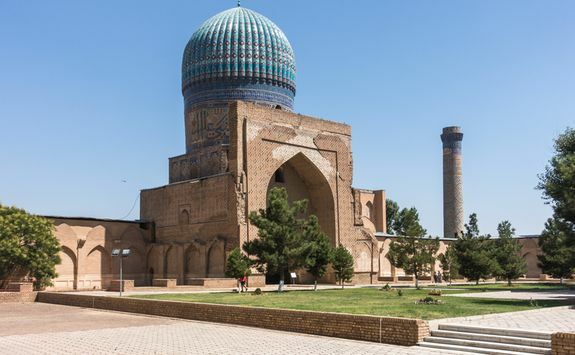 This was where Tamerlane built a simple crypt, designed as his last resting place. 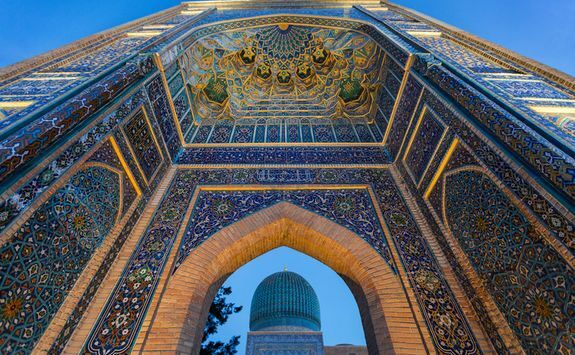 However, his humble wishes were not honoured and instead he lies in splendour in Samarkand. 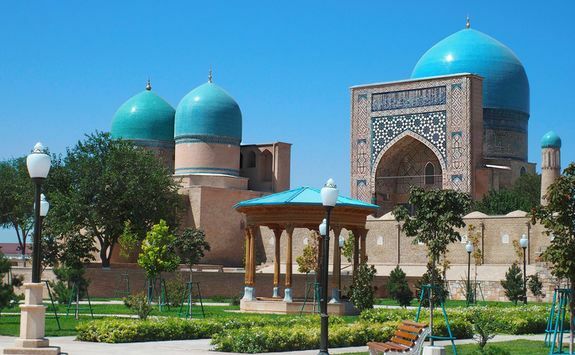 After your exploration, stop for lunch and then travel back to Samarkand for your last night in the city. 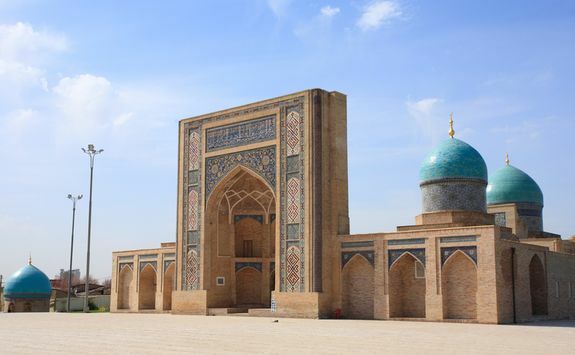 Say goodbye to Samarkand today as you are transferred to Bukhara. 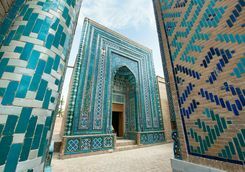 After stopping at a silk paper factory on the way you'll be journeying south along the Royal Road (or Shokh Rokh), the major Silk Road uniting the cities of Transoxiana, Samarkand and Bukhara. 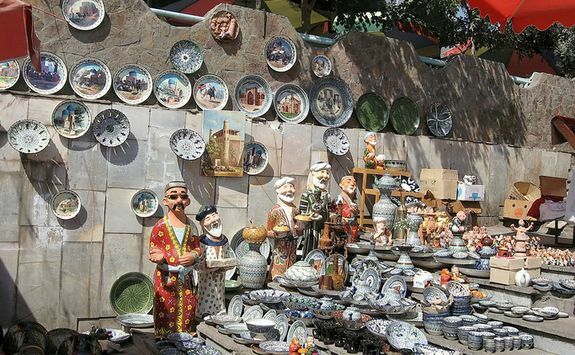 On the drive, stop at Gidjuvan for lunch in a local house and enjoy a tour of the famous pottery workshops of brothers Abdullo and Alisher Narzullaev. 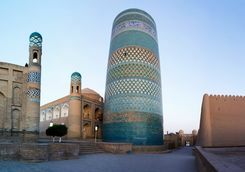 Gidjuvan also has a rather beautiful minaret known as the Vabkent minaret. 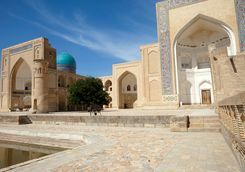 After a little more time on the road you'll then arrive into Bukhara late in the afternoon, after around six hours total driving time. 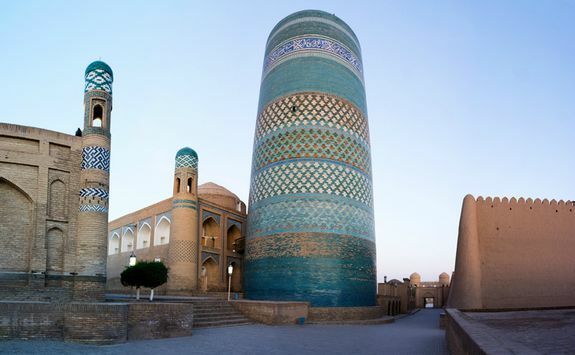 Spend a full day sightseeing in Bukhara today, visiting the city's many mausoleums, mosques and minarets. 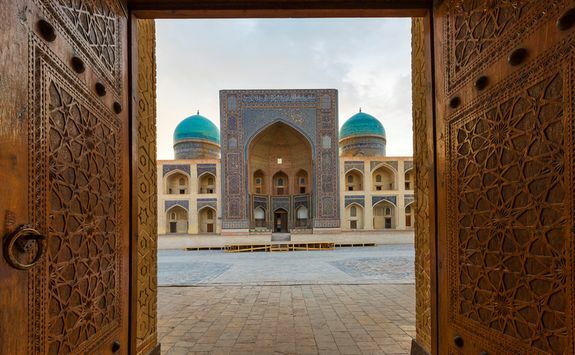 Bukhara is a lovely place, and everything is easily accessible on foot so Amelia and your local guide will be able to show you around easily. 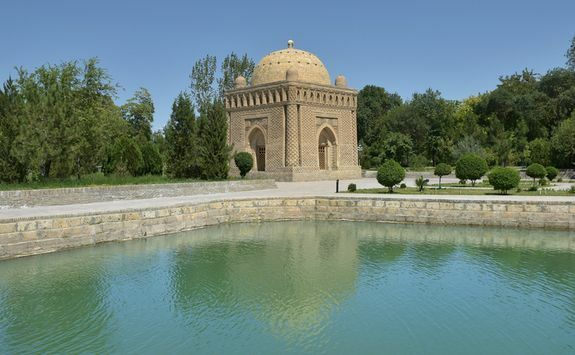 Wander into the complex of the Ark Fortress and step across to the exquisite Bolo Hauz, the Emir's personal mosque which perfectly reflects its facade in the lake in front of it. Lunch will be eaten al fresco by the fruit trees in a local family-owned house/restaurant, and then the afternoon is yours to wander through the bazaars people watching and shopping to your heart's content. 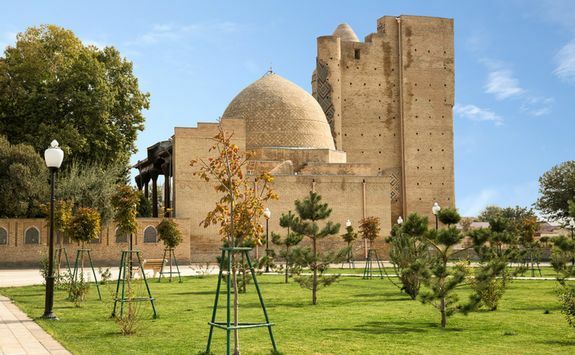 Today you'll head out of central Bukhara to visit some of the famous sites near the city. 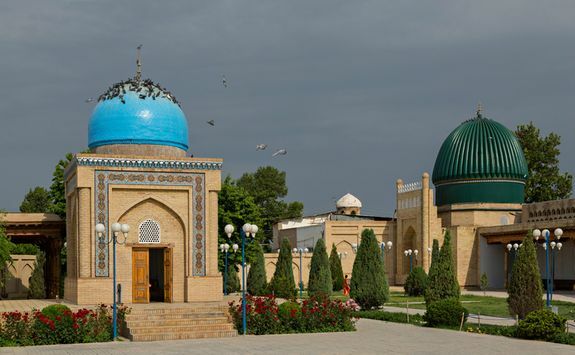 Start at the famous Bahhaudin Naqshband Mausoleum and then Chor-Bakr Necropolis, otherwise known as 'the city of the dead'. 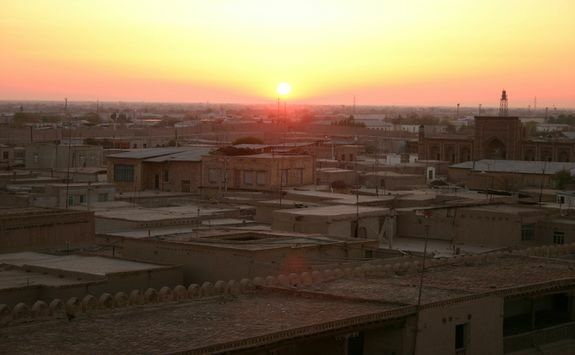 Here you'll find streets, courtyards, gates and family dahmas (gravestones). 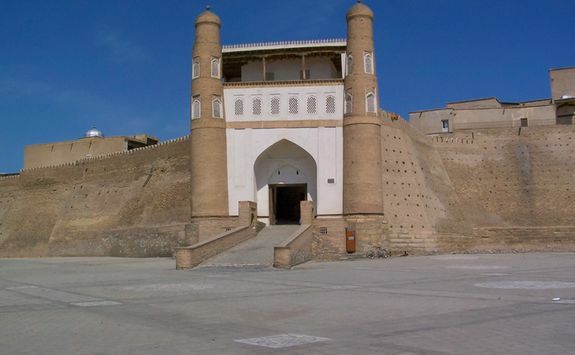 Next, visit Sitoria Mokhi Khosa, which was the summer palace of Bukhara rulers. 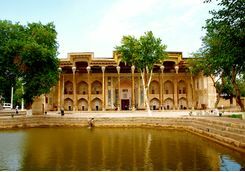 A new palace was finished in 1913 and boasts exceptional artistic value; the hall is decorated with exquisite ornamental paintings and the walls are all covered with mirrors. 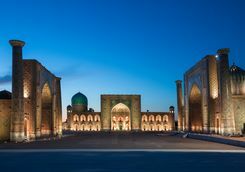 Finish the day at Chor Minor, a four-arch dome structure and the unforgettable masterpiece of the Mausoleum of Samanids, dating back to the 9th and 10th centuries and built from individually made baked bricks, making it appear as intricate as lace. 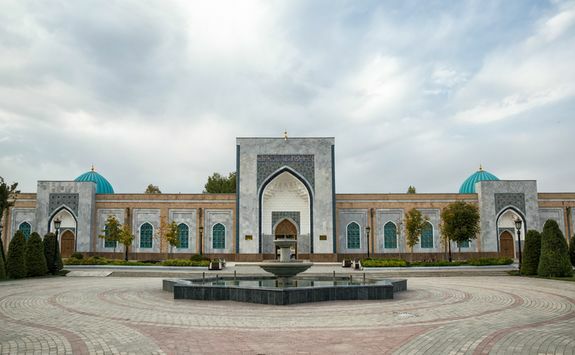 Later in the evening you will then see a fashion and folklore show at Nadir Divanbegi Madrasah before heading back to central Bukhara for the night. 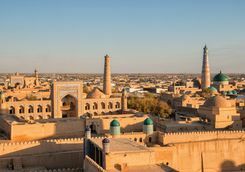 Today you have a long day of travelling ahead of you, so fill up with a good breakfast and then get stuck into a good book as you drive towards Khiva. There will be a good long stop en route for lunch however the total journey time will be around eight hours, so make sure you're in comfy clothes. 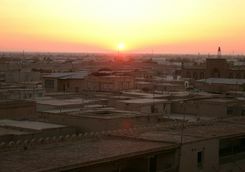 Upon arrival, most likely at sunset, there is time at leisure to relax in your hotel before heading out on foot to one of the many nearby restaurants for supper. 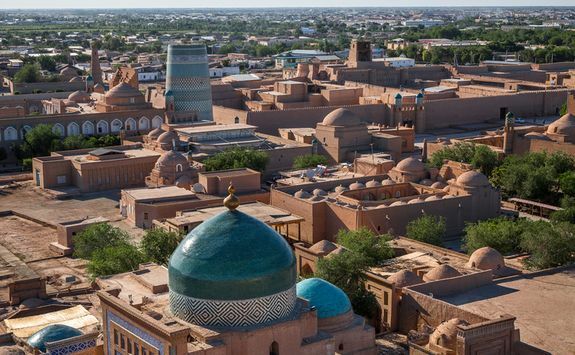 It's back to sightseeing today with a full day in Khiva. 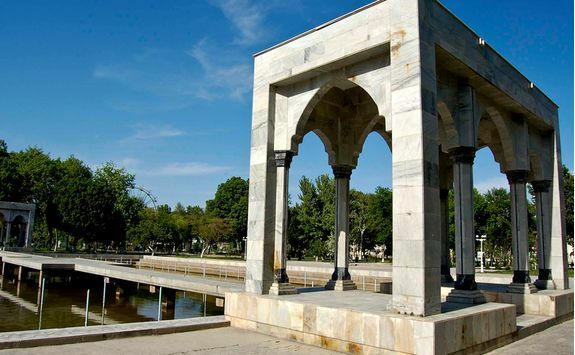 You'll explore the Ichan Kala part of the city with all its beautiful medieval architectural monuments. 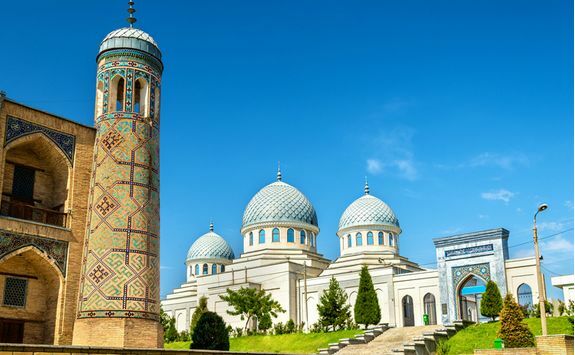 Visit Kunya-Ark citadel, Tosh-Khovli Palace and its elegant ornamental gates, followed by Kalta Minor Minaret, Juma Mosque (with its 112 carved wooden columns) and Pakhlavan Makhmud Mausoleum. 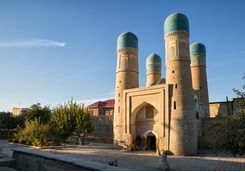 The silhouettes of the towering minarets surrounded by strong clay built walls and flat roof houses present the picture of a typical Central Asian feudal city. 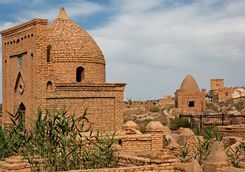 This morning set off to the desert to meet the Tartar nomads and explore the mystical desert kalas (fortresses) including ancient Toprak Kala and Ayaz Kala. 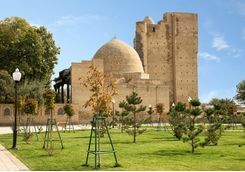 The drive will take around two-and-a-half-hours each way but the desert landscapes will be well worth it when you arrive. 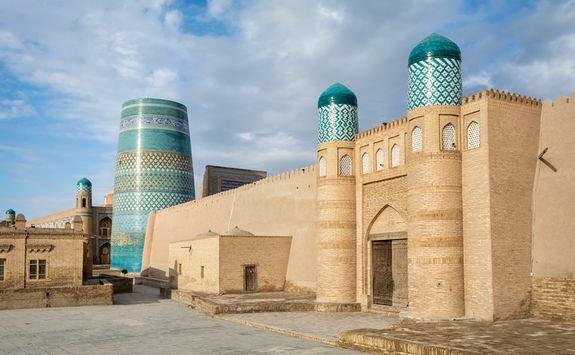 After lunch in yurts here, journey back to Khiva for an afternoon at leisure. 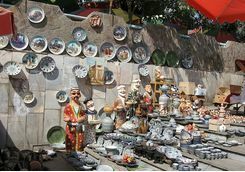 You might like to re-visit some of the sites from the previous day, relax in one of the many cafes or stock up on woollen mittens - a famous Khivan handicraft - from the market. 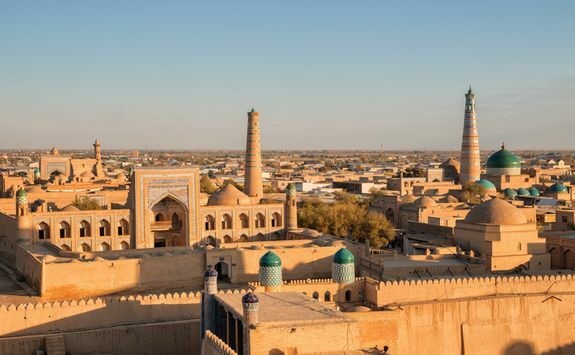 Later on, dine at a popular local restaurant for your last night in Khiva. 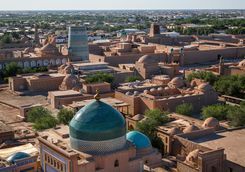 Today you leave Khiva to visit Nukus. 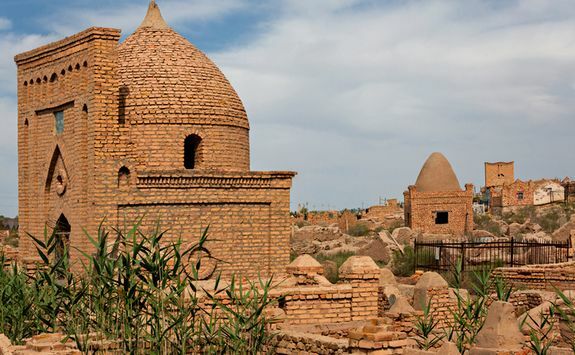 At first glance, Nukus may not be a town one might think to visit, being stuck way out in the desert. However, it hides a gem - the Igor Savitsky Museum - that houses one of the world's finest collections of Soviet avant-garde art from the 20s and 30s. 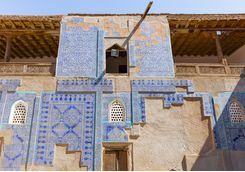 This extraordinary collection of art has survived thanks to the museum being in such a remote location. 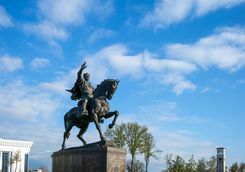 There are also other collections of art including Russian icons and folk art, a good three hours is required to appreciate the collection in its entirety. 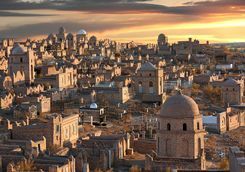 The story of Igor Savitsky and how he came to curate this art in secrecy is a fascinating one and immortalised in a film: The Desert of Forbidden Art. 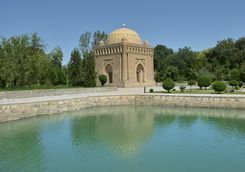 Another sight worth stopping by to visit is the Mizdarkhan Cemetery, located about nine miles from the city. 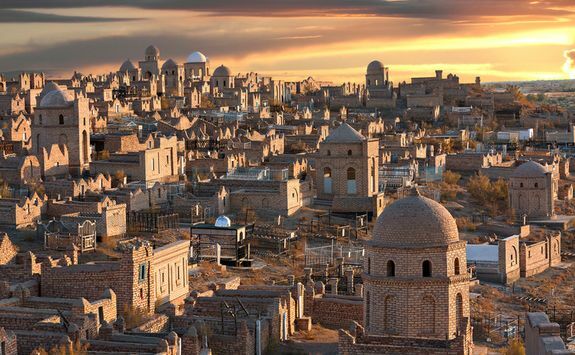 The cemetery contains well over a thousand graves and was once an important sight for handicrafts on the old Silk Road (until destroyed by Tamerlane). 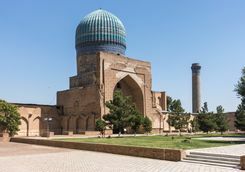 You'll spend a couple of hours at the museum before heading to the airport in the evening to fly the three hours back to Tashkent for the night. 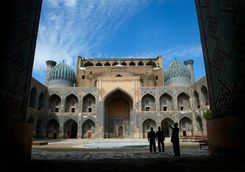 This morning, check out to drive from Tashkent to Fergana Valley, with a visit en route in Kokand, the capital of the Kokand Khanate in the 18th and 19th centuries. 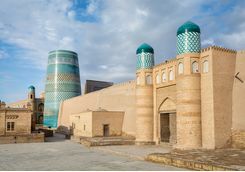 In Kokand you'll visit the Khan's Palace Museum and Rishtan, one of the most important ceramic centres in Central Asia. 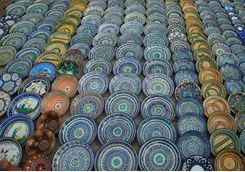 You will also see the home of potter Rustam Usmanov, where his family make the traditional Uzbekistan ceramics of the region. 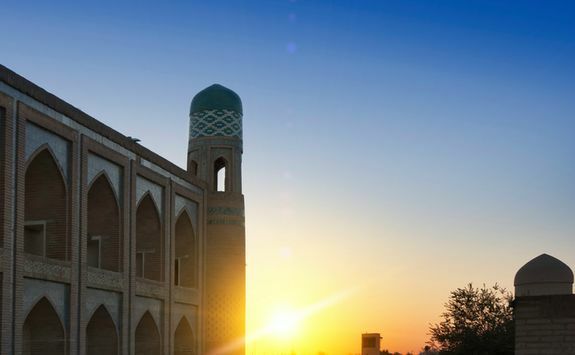 After your fill of exploring Kokand, continue the drive to Fergana, arriving in the late afternoon. 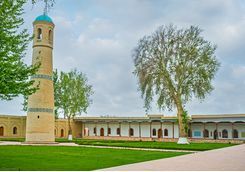 Fergana is probably best known city in the heart of Uzbekistan, and a third of the population live in this fertile floodplain of the Syr Darya. Rock-carvings high in the mountains reveal ancient scenes of hunting and agriculture, and farmers continue to plough the fields in what they call the Golden Valley. 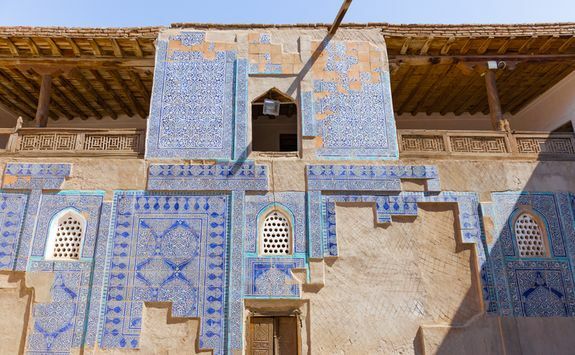 The scenery is stunning and distinctive for its local architecture and traditional crafts, from silk-weaving and wood-carving to pottery and knife making, making the area a very worthwhile stopover. 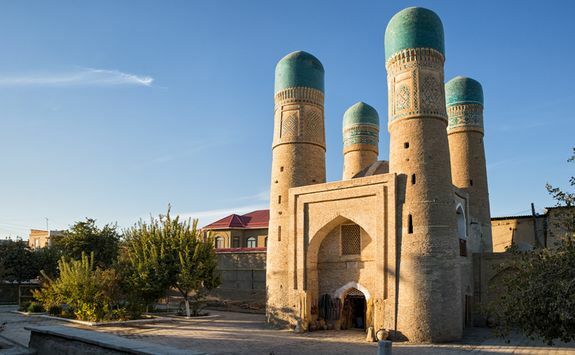 Throughout this beautiful region, you will find stunning landscapes, a relaxed and friendly people, ancient chaikanas (teahouses) and some of the most impressive craftsmanship surviving on the Silk Road today. 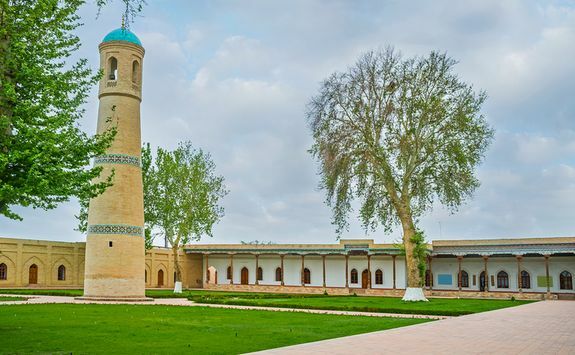 Drive to Margilan today to visit the silk ikat weaving centre and the Margilan craft centre, supported by UNESCO and housed in a historic madrassa. 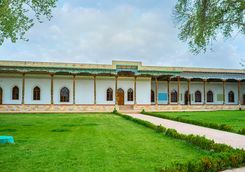 Of special interest here is the velvet ikat weaving workshop of Rasuljon Mirzaahmedov (some years ago Oscar de La Renta made a collection of Rasuljon's fabrics). This factory produces silk using hand done traditional techniques and processes. 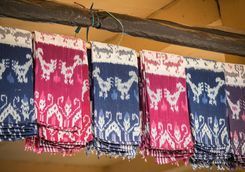 You will get to see every aspect of the process from reeling the silk from the cocoons, winding skeins and warps, natural dyeing, loom preparation and weaving. 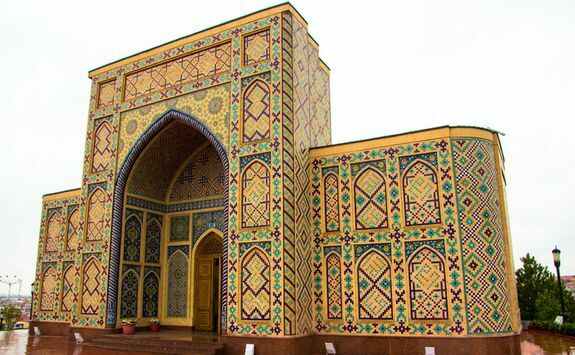 There is a lovely small shop here where you can purchase many exquisite examples of traditional Central Asian ikat. 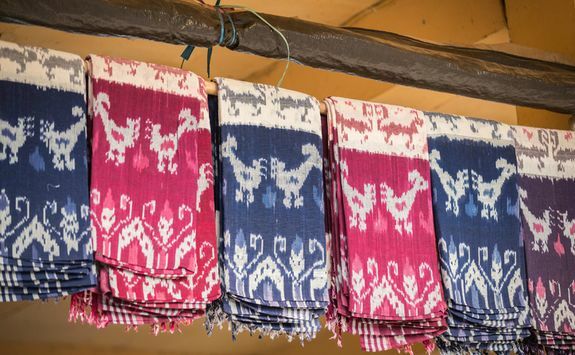 After the silk factory, and time allowing, you may be able to visit a hand block printer's workshop in Margilan. 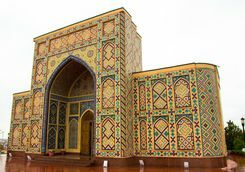 Salijon Ahmadaliev works with natural dyes to produce the traditional woodblock printed cloths that you will see all over this region. 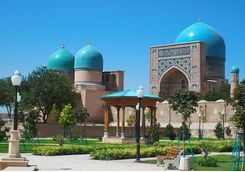 Then, later in the afternoon take a train from Margilan train station back to Tashkent for a final night in the capital. Celebrate the end of a great tour over dinner with the group. 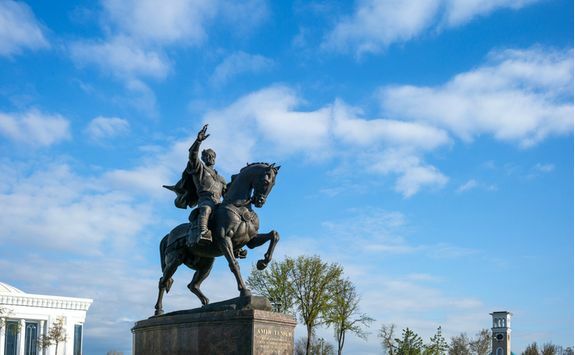 This morning you have time for one or two last sights in the city; perhaps a ride on the metro or a visit to the Museum for Applied Arts if you haven't been already. 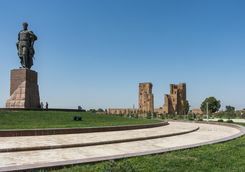 You'll also want to walk through some of the main squares and parks in central Tashkent and stock up on last minute vodka and/or caviar before a last group lunch. Later this afternoon, you'll be transferred to the airport for your flight back to the UK. As with on the way you'll be flying direct and the flight time is around seven hours, so you'll land tonight UK time. 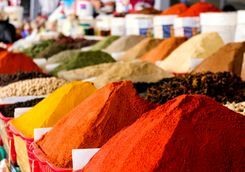 Amelia is our expert for this itinerary and, as a seasoned traveller, has the inside track on the most memorable adventures.